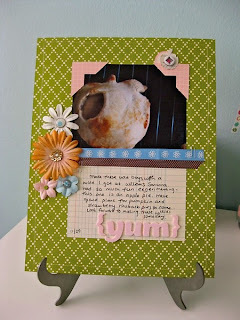 This one below is an ode to some delicious mini apple pies I made several weeks ago. Loosely lifted off a page from SBE 2 years ago by Cari Fennel. 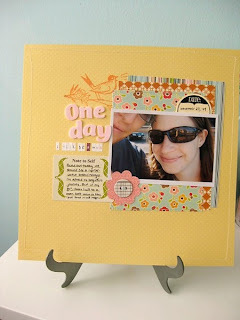 Used mostly a combo of October Afternoon and American Crafts here, which seem to be my go-to swoon-worthy companies lately! And speaking of American Crafts--how do y'all like the new Letterbox line? I'm really pumped for it, and will have a little giveaway with Letterbox soon, so stay posted! This one below is more personal. My husband and I have been dealing with infertility, and I've started scrapbooking about it as a cheaper alternative to therapy:) I wanted to make this page light and happy to express hope. Want to be able to turn to it at a disappointing moment and be uplifted. 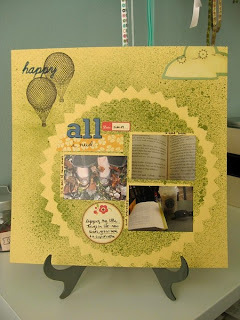 How have you used scrapbooking to help you through difficult times? Do you avoid tough issues in your pages and foucs on the good, or tackle them head-on? This next page records the very first time I misted--and I certainly wasn't shy! 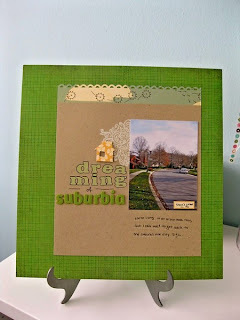 I used Collage Press die-cuts as a mask and a lot of Studio Claico stamps throughout. Can't decide if it's "too much" for me or not, but enjoyed the experimenting! And I desperately want to get my hands on some letterbox. The colours are so soothing. Well, first, I have to say that your pages are just lovely! And yum is right on that first layout! The constitution says that a referendum will be called to decide if the president remains in power if a second petition is signed by at least 20% of the electorate,miu miu outlet or nearly four million people.But the government has already made it clear that the referendum will not go ahead. 'Foreign intervention plot'Mr Maduro accused the United replica handbags uk States of leading a plot to deployforeign troops in his country, and force him from office.He told foreign journalists that a US military plane entered Venezuelan air space twice last week without authorisation.Politicians and media from outside the country have been trying to sow chaos in Venezuela to justify intervention, he said.cheap replica handbags"This whole campaign, has a centre. There is an axis: Madrid, Miami and Washington," said Mr Maduro. "But there is a centre of planning, of direction, lobbying, strength and funding. That centre is located in Washington. "He promised to fight back and to do everything in his power "to continue winning the battle for internal peace".chloe replica Mr Maduro also made reference to the recent suspension of Brazil's President Dilma Rousseff to face an impeachment trial.He described the process as a coup, backed by foreign powers. Happy Chanuka and a Toot! New Layouts and a Giveaway!